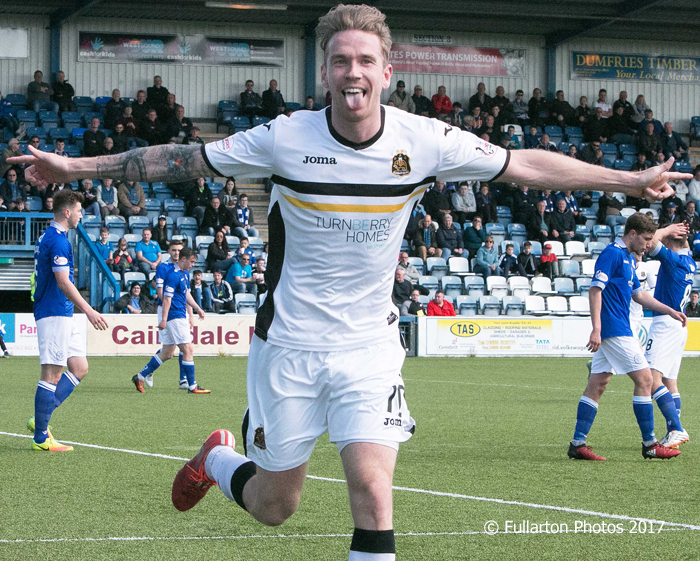 DUMBARTON moved up from ninth to seventh place in the Ladbrokes Championship with two matches left thanks to a 2-1 win over Queen of the South at Palmerston Park. DUMBARTON moved up from ninth to seventh place in the Ladbrokes Championship with two matches left thanks to a 2-1 win over Queen of the South at Palmerston Park in front of a 1,289 crowd. The result gives Stevie Aitken's men a real chance of avoiding the relegation and play-off places. On 14 minutes a spell of pressure from the Dumfries side paid off when ex-Son Stephen Dobbie got on the end of a neat move. He made it 1-0 with a fine turn and finish into the bottom corner past keeper Alan Martin. Minutes later Dumbarton were level. Sam Stanton scored with a superb free kick into the top of the net from the edge of the area after Lewis Vaughan was cynically fouled by home skipper John Rankin. Three minutes from half time Sons were in front. A skilful cross from Christian Nade was met by a fine header from Robert Thomson (pictured) to make it 2-1. After the break the home side began to pile on the pressure, with Sons confined to breaks and set plays. Just before the end substitute Garry Fleming, on for Nade, stole the ball from Kyle Jacobs and lobbed over keeper Lee Robinson, but it bounced wide from a very tight angle. The relief and joy from the away support was palpable as the final whistle blew.